By Melissa Lennig on June 21, 2015 5 Comments. This content contains affiliate links. As an Amazon Associate I earn from qualifying purchases. Strawberries welcome summer vacation in the sweetest way. 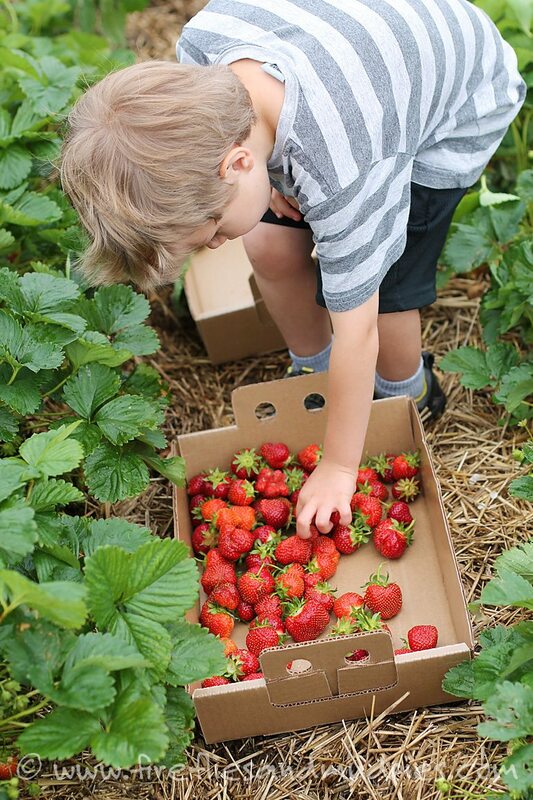 Picking them is one of our very favorite family traditions. Usually I can strawberry jam, but this year since my canning supplies are packed (we are moving to a new state in a few days), we only picked enough to eat…and drink! 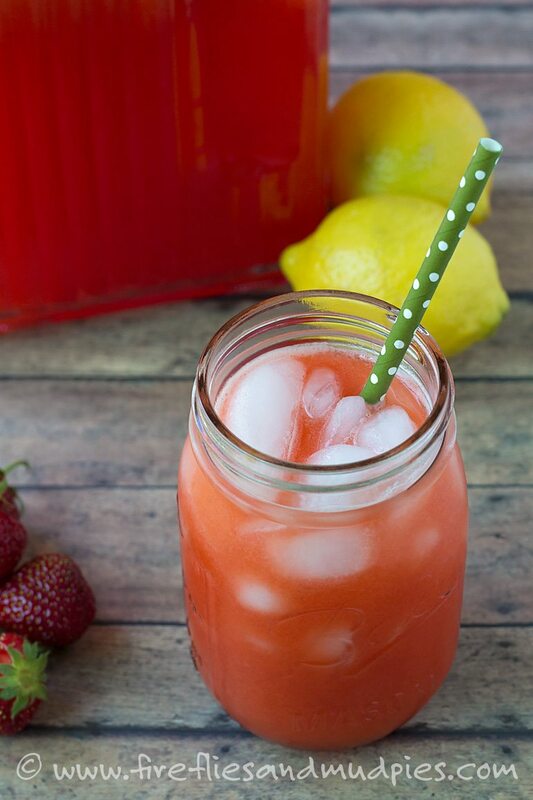 Shared below is a heavenly recipe for Fresh Strawberry Lemonade. I hope your family will love it as much as mine did! That’s him picking berries…right out of my box! What a stinker! Honestly though, I don’t really mind! 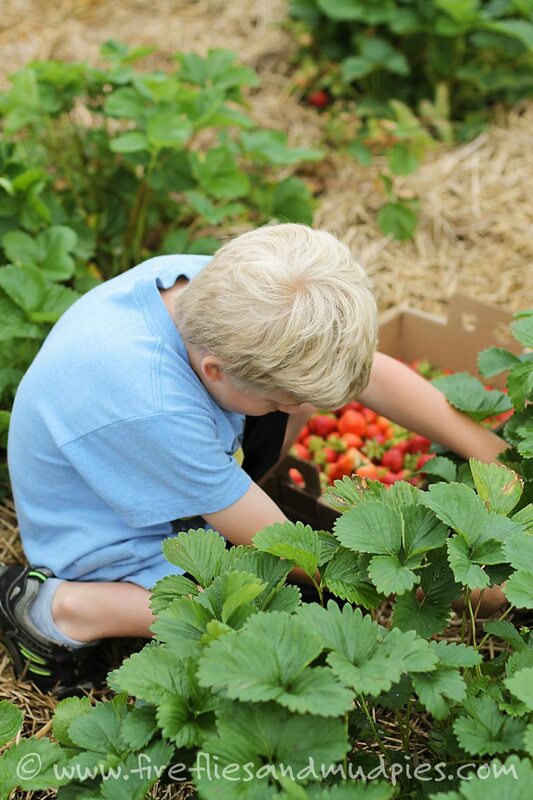 Berry picking is meant to be fun and it’s a great way to get outside and connect as a family. Fill a [url href=”http://www.amazon.com/gp/product/B00EZP4D3G?ie=UTF8&camp=1789&creativeASIN=B00EZP4D3G&linkCode=xm2&tag=firandmudpie-20″ target=”_blank”]pitcher[/url] with 8 cups of water. Squeeze the lemons into the water with a [url href=”http://www.amazon.com/gp/product/B00KH9PXZ6?ie=UTF8&camp=1789&creativeASIN=B00KH9PXZ6&linkCode=xm2&tag=firandmudpie-20″ target=”_blank”]lemon juicer[/url]. Combine the strawberries and sugar in a small saucepan over medium heat. 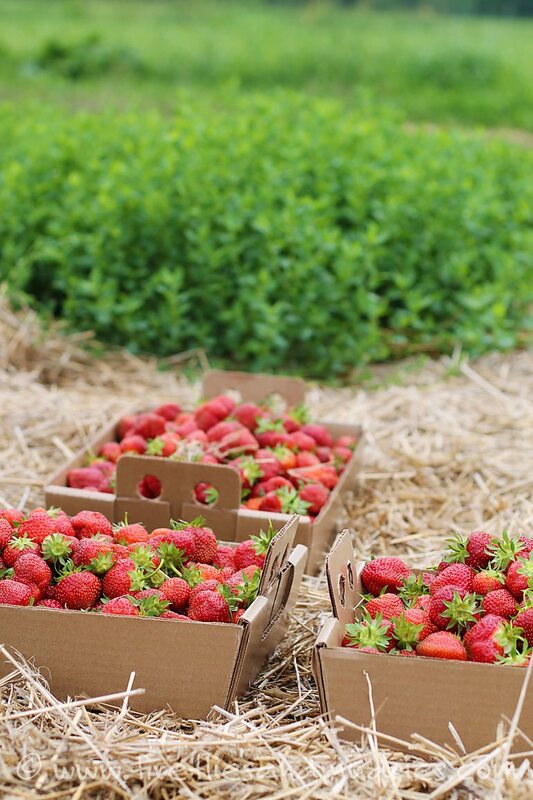 Squish the strawberries with a fork and allow them cook and “pop” until a rich, red syrup is formed. Alternatively, you could push the strawberries through a [url href=”http://www.amazon.com/gp/product/B003R28HWQ?ie=UTF8&camp=1789&creativeASIN=B003R28HWQ&linkCode=xm2&tag=firandmudpie-20″ target=”_blank”]juicer[/url]! That’s what I did! 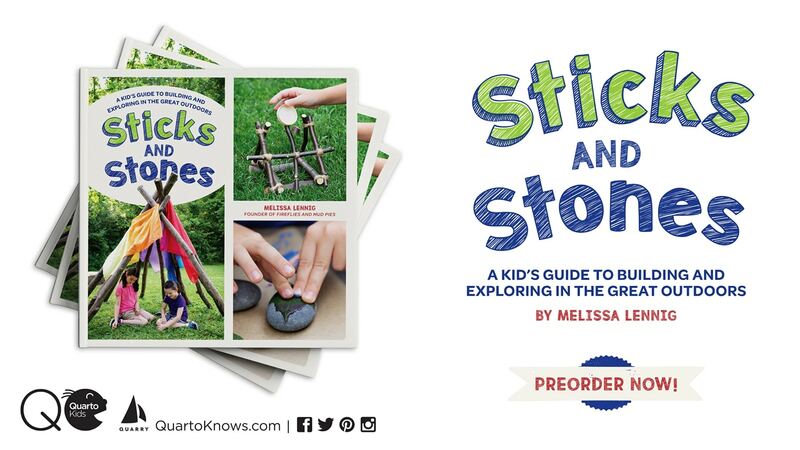 Place a [url href=”http://www.amazon.com/gp/product/B007TUQF9O?ie=UTF8&camp=1789&creativeASIN=B007TUQF9O&linkCode=xm2&tag=firandmudpie-20″ target=”_blank”]fine, mesh strainer[/url] over the pitcher. 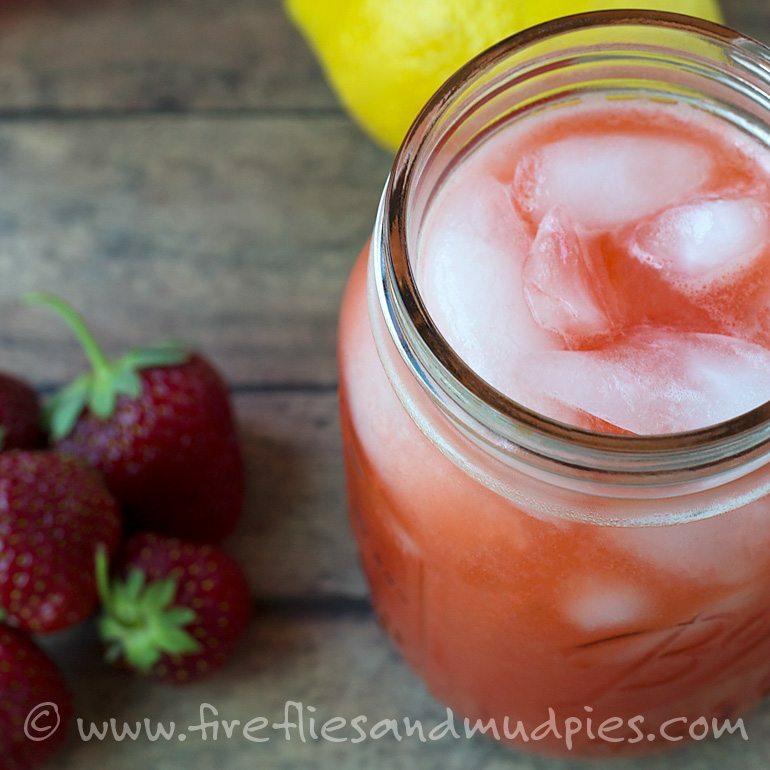 Pour the strawberry syrup into the lemonade through the strainer. Press down on the mixture with a spatula to squeeze out the juice. Yum! Thanks for sharing this recipe. I’ve made it for a summery luncheon tomorrow.